For 2019 there will be no vendor fee. The following rules are for your protection, your customer's protection, and for the protection of the venue & organisers; they also help to maintain the standards and quality of the Games. Read carefully prior to booking a space to be sure that your booth complies with them and to avoid any misunderstandings. Craft items offered for sale must be handcrafted by the exhibitor and suitable for display in a public area. Commercial products must be of a high quality and preferably with a Scottish, Mi'kmaq, Acadian or Canadian theme. Items must not be of an offensive nature. Suitability will be at the sole discretion of the event organiser. Food vendors must comply with all food hygiene and safety standards and must produce any valid certificates including Insurance prior to set up at the event. Exhibitors are expected to keep their items neatly displayed at all times and to be at their designated space during the hours the Games are in progress. All displays, tents/canopies/products and storage boxes must be kept within the dimensions of the space they are allocated and must in no way obstruct or endanger the neighbouring people or areas. All garbage is the responsibility of the vendor and must be removed after the Games have ended. Each vendor is responsible for adhering to provincial, and municipal regulations and restrictions regarding their individual stock. Collection of HST & GST & Insurance is the responsibility of the registered exhibitors. 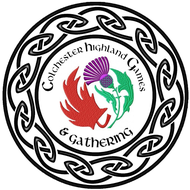 The organisers & venue accept no liability for any dispute, loss, damage, injury or death arising from your attendance at the Colchester Highland Games & Gathering. Smoking, drinking of alcohol, and recorded music are not permitted in the exhibition areas. All spaces that are not occupied and set up by 09.00hrs on Saturday will forfeit their space. *By Completing this application and checking the box above I am confirming that I have read and agree to abide by the Rules & Regulations in Step 1 of the application process, and I am aware that my application may be refused or that I may be asked to leave the field if I break these rules. I am responsible for any public dispute arising from my presence at the Colchester Highland Games & Gathering. Applications must be received prior to the event to guarantee a place.